Their bow game is out of control! 45’s all day! 45 is the degree of the bow, a very respectful amount. Staying at the suite there is a life I’d like to live, but even getting to live it one day was an amazing experience. This cost me $70 (credit card annual fee) plus another $70 (8000 yen op-up) for a suite upgrade. Totally worth it for the experience. The Chase IHG credit card gives you a free annual night at ANY of their hotels…that is of course after the $70 annual fee. Once you arrive at Osaka station, head north. You’ll see a tall skyscraper with a bridge leading towards it. Walk north through the building and you’ll arrive at another bridge that connects you to another skyscraper. That is the Intercontinental. When you enter the building after the bridge, take the first set of escalators down one level. Then continue to walk straight (north) through the building. You’ll pass a large plaza with a coffee shop on the left. As you enter the next hallway the entrance to the Intercontinental will be on you’re right. It’s very discreet. Once you make it through the entrance, a hotel worker will guide you towards the elevators where you’ll go up to the 20th floor. You’ll check in on the 20th floor and take in the amazing view. I was there on a 1 night stay from paying the Chase IHG Credit Card Annual fee so I decided to treat myself to a suite. They presented me the key, bowed and I walked away. They held that bow until I was completely out of view. I’ve been to Japan a few times before, but the bow game at the Intercontinental was out of control. 45’s from every employee I passed by. 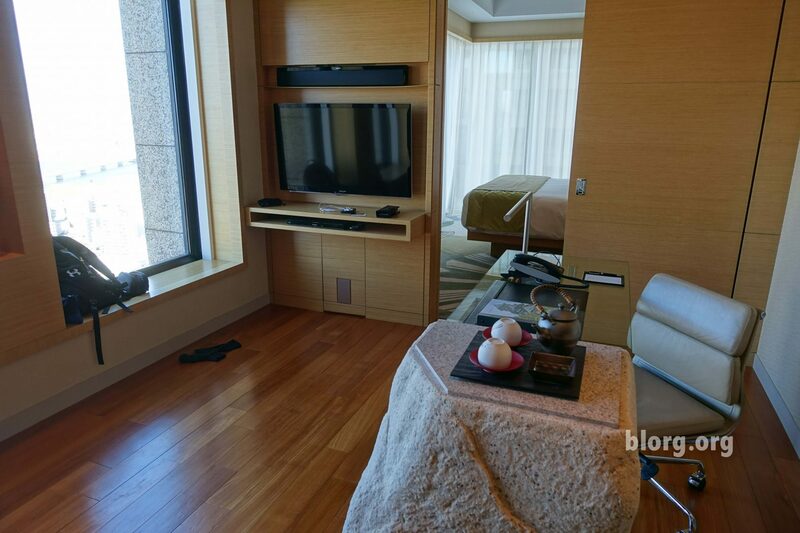 They gave me room 2403: a corner suite that combined modern influences with a minimalist Japanese style. I want to live in an apartment just like that. It was very efficient. I opted for the 2pm late check out to make full use of the facilities. The next morning, I started my day at 10am by going to the hotel gym. There’s a separate set of elevators between the rooms, reception and entrance. So to get there, I had to take an elevator down to the 20th floor to reception, then down to the 4th floor. As the doors to the 4th floor opened, I was greeted with a bow from the receptionists on the floor. They asked me in Japanese what my room number was (presumably) then I said in English “I’m staying in 2403 and am here to use the gym.” They quickly switched to English and kindly walked me to the gym, bowed and returned to the reception desk. I only took pictures of the falling snow on my Fire HD8 Tablet (low quality pics). It was beautiful watching the falling snow as I got to run on the treadmill. The gym was very modern and spacious. No one else was there. I ran/walked for an hour with the goal of getting very tired. The plan after checking out was to take an afternoon train ride from Osaka to Kinosaki Onsen (3 hours). Upon entering the bath, take off your shoes and place them in the shoe locker associated with the number you were given. I was given #20 so I used shoe locker #20. Proceed to the changing room find your clothing locker (#20). After being given the instructions, I confirmed that I understood and then she walked me to the entrance of the bath, bowed and then returned to reception. When I walked in, I was fortunate to be the only person there. I made it through the first 6 steps and then decided to hop in the dry sauna and then steam sauna. There were signs saying towels were okay to wear while in the sauna. Even though I was on my own, of course I’m wearing a towel. Those seats get hot and I’m not trying to get my junk burned. I showered again feeling extremely clean after using the sauna, got dressed and then made my way to the exit. As I was leaving another guy was entering the bath and I was happy that I made it through a Japanese bath without having to see another naked guy. There was also a large pool and Jacuzzi on the 4th floor but I was running out of time to and couldn’t go for the full experience. I returned to the room and packed up and got ready to catch the 2pm train to Kinosaki Onsen.